I had been staring at the sheet of vellum filled with my own handwriting and row after row of hastily sketched diagrams for more than half an hour, miffed by my repeated failure to break down the spell I was studying today into smaller, more comprehensible fragments. I had made some progress through the morning and into the afternoon, yet at this late hour my depleted brain refused to operate properly. I drew a fat, angry line across the page, and then crossed it with another one, ending my latest exercise in futility with a few exclamation marks at the bottom, and finally ruining the quill. It broke with a loud crunch, and that certainly did not help to improve my spirits. There was still a pile of untouched arcane manuscripts on my desk, and I was swiftly running out of time as our stay in Darromar was stretching into the third week of Uktar, and I only had until the 20th of Nightal to reach Evereska – a task which after Adalon’s revelations I found as humiliating as it was inane. I was thirsty and slightly light-headed from the sheer volume of the day’s work; Chyil would have said that I had been running myself into the ground once again, but at least I never experienced a repetition of the panic attack that had happened when I touched my first spellbook. My head began to throb - the room was too warm for my taste, even though outside the howling winds dragged the last remnants of autumn foliage along the wet streets and alleys of Darromar, and my narrow windowpane was lashed with streams of cold rain. It was still early in the season to augment the heat – but The Gilt Unicorn was expensive accommodation, and Kessen had paid our lease in full for a whole month without blinking an eye at a price that in my opinion could have bought us a small house in the poorer district. It looked like Addazahr’s gold had gone to the boy’s head, as upon reaching the Tethyran capital he had acquired a taste for luxury, unexpected in a youngster from a small backwater village lost in the heart of the desert. The suite that Kes had rented occupied half of the second floor of the inn, consisting of three large bedrooms, a lounge, and a personal bathroom - even though the Unicorn sported a lavish dining hall, and a spacious bathhouse with ceramic tiled floors and gleaming copper tubes. At least the owner was not trying to save on coal, I thought grudgingly. The fireplace in our private lounge was always lit and tended by a serving maid throughout the day, and the inn public bathhouse had hot water in abundance. I suppose the comfort was important for the twins, for they had looked ever more despondent as we had ridden north and east in our journey across Tethyr. And even though Darromar was no more than a week’s ride from the southern border with Calimshan – the same as from the seacoast - the change in climate had been more dramatic than I had anticipated. As the heat of the desert and the relatively dry chill of the Marching Mountains had been left behind, the steppes and groves of southern Tethyr had met us with onslaughts of the cold autumn rains. I had felt more invigorated and refreshed with every mile north, but the brother and sister had been shivering under their sodden cloaks all the way across the Tethyran lands, and had arrived in Darromar in a state of complete misery, exacerbated by the red runny noses and recurrent sneezing. Privately, I mused if their desire to accompany me to Evereska would wane as we moved further north in the face of the incoming winter. Thus, I had not the heart to protest when Kessen had demanded directions to the most comfortable lodgings in the city, or when he had insisted on hiring half a floor of a luxurious inn in the expensive Royal Quarter. To be frank, I had been too preoccupied with my own problems to pay much attention to his expenditures until it had become too late to change things without attracting unwanted attention. We had split the treasure between the four of us (since Miamla obviously was not entitled to a cut), and the twins’ shares were theirs to spend as they wished. 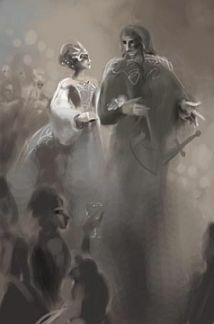 Although, I could not but wonder if they were intent on transferring all their money to the pockets of Darromarran merchants in the shortest time possible, and judging by all the expensive clothes and jewelry that the siblings had been flaunting lately, that was indeed the case. Why the usually intelligent and level-headed Mirriam had succumbed to her brother’s insanity I had no idea; but she seemed to be under his influence in the matter, and the seamstresses and apparel makers filled the spacious bedroom which she shared with Miamla with deliveries of ever more extravagant outfits. On the positive side, I was left to enjoy near anonymity, since Kes’ eccentricities drew all the public attention - everyone was interested in the ‘two wealthy scions of a Calimport prominent merchant family’, who had fled the clutches of their evil relatives with a handful of friends and servants and most of their late father’s treasury. The legend was not that far from the truth – considering that Esamon was a sort of a trader, although the source of the twins’ wealth was far more exotic. I was supposed to play the role of an elven friend and legal guardian of their late father’s estate, who had refused to help assassinate the rightful heirs and had had to flee Calimshan together with his charges. Miamla was pretending to be my small daughter and Omwo the ‘trusty house bard’ of the ‘deceased merchant’. It was not particularly difficult for me to pretend to be someone I was not – if simply because I had no ‘true’ identity that could interfere with my assumed mask; and after spending nearly six months in Calimshan I knew at least something about its customs and traditions. Even my Common speech was tinted with a Calimshite accent, which I discovered to my true amusement after a few remarks from the Unicorn servants. Perhaps the long hours spent listening to Chyil’s endless tales had had some effect on my new personality. I spent most of my time in The Royal Library of Castle Faemtam, which was open to the general public during the daytime hours, consuming tome after tome of human history, and an occasional elven manuscript. There were quite a few of them available as Queen Zaranda deemed herself not only a monarch-educator for her people, but also a ‘protector of minorities’ and an ‘elf friend’. My knowledge of the past and present history of this world had expanded greatly, and although I still ran into an occasional black hole, more often than not my own erratic memory supplied the facts missing from the text that I was studying. When I was not perusing the dusty tomes, I explored the magic shops that seemed to pop around the city like fresh crop of mushrooms after the rainy season. Darromar was rebuilding itself after centuries of neglect and decades of civil war and interregnum. It had benefited greatly from its new status as the royal capital. I could see posh boutiques, shops selling delicacies and imported luxury goods, and the hastily built palaces of the ‘new nobility’ in every corner. Needless to say, most of my money had been expended on books, scrolls and magical supplies – but I had kept a hefty reserve to pay for future travel expenses with one of the caravans heading in the right direction. Unfortunately, securing the passage was proving to be a difficult task. The neighboring state of Amn, through whose territory we would have to travel, was ablaze with an ongoing war with her monster population. Amnian ogre, goblin, and giant tribes had united and proclaimed the so-called Sythillisian Empire in her southern provinces, with a capital in the overrun human port of Murann. I was mightily amused by the fact that the past military conflict in Tethyr was generally called the ‘liberation’, because it had been a war of humans against fellow humans that had resulted in the ascension of Queen Zaranda to the throne, while the current struggle in Amn was regarded as a dreadful calamity, as obviously the ogres did not deserve a state of their own (a view with which I agreed somewhat cynically, but found terribly one-sided). It looked like Zaranda was a very shrewd politician – she was fortifying her borders and letting the Amnian forces weaken themselves in battles with the ogres, while at the same time bargaining with the Amnian Council of Six for the right to annex two major Amnian trade cities as a payment for her possible intervention in the conflict on the humans’ side. Her excuse was as old as the world itself, supposedly the two cities in question had voted to abscond from Amn and join Tethyr. But Zaranda’s political maneuvering aside, I had almost despaired of finding a suitable caravan heading north - there were rumors that the Amnian cities of Trademeet, Brost, and Esmeraltan had already fallen into the ogres’ hands, and that the Sythillisian legions were marching on Athkatla. My only hope now was to join a military convoy to Riatavin - that was one of the two rebellious Amnian cities into which Tethyr had quickly moved small garrisons of royal guards. And so, while waiting for such an opportunity, my days were spent on bribing the rumor-mongers in the markets, visiting the palace library, and saturating my brain with every scrap of magical knowledge that money could buy in the bustling metropolis of nouveau-riches and parvenus. Tonight, the broken quill was the last drop that overflowed the cup of my patience. I threw the useless remains of what once had been a tail feather of some unfortunate fowl onto the floor, and decided to take a trip to the kitchens and find out if they could send up a tray with a late supper, as it looked like I had already missed all other meals of the day. To my slight puzzlement, my companions were not in the apartment. Despite the late hour, the lounge was silent and empty of any activity, although not of the abundant signs of habitation. Mirri’s rolls of maps and bottles of colored inks, Kessen’s costly paraphernalia, and Miamla’s dolls were scattered all around the spacious chamber, which was already cluttered with too much furniture and strewn with Calimshite rugs. Omwo was the most orderly of them all – his papers were neatly stashed on the chiffonier in the corner of the bedroom that he and Kessen occupied together. Admittedly, my own room was an image of well-organized chaos, but at least I never let my work spread out onto the shared territory – something that my companions could never comprehend or follow. I vaguely remembered that the halfling had had an assignation for tonight – something about meeting an old friend from the days before Zaureen’s troupe had ventured into the desert. I was sullenly munching on the delivered snacks, sipping from a cup of watered wine when they finally arrived, filling the room with smells of wet wool, richly spiced food, alcohol, and a whiff of expensive perfume – a habit that Kessen had attained after visiting a few fashionable fetes. To my small relief, his sister refused to follow in his steps, and shunned the use of the heavy cloying scents so popular among the Darromarran upper classes, (but perhaps my single remark about the aversion that I felt to this habit had something to do with it). Tonight Mirriam was wearing one of her latest acquisitions – a low cut gown of green silk, with lots of pink embroidery around a bodice, which in my opinion fitted her as well as a saddle and a fancy bridle would have fitted a wild deer doe. Her dark hair was pulled up and arranged into a complicated coiffure stuffed with fake wax flowers, her neck weighted down with a long string of rare pink pearls. Well, at least those were real enough and could be sold for half of their original price if the need arose, I thought sardonically. “Fancy you all of a sudden paying attention to the child’s schedule! You’ve been happily ignoring her, ever since you convinced us to take her along.” Mirri snapped at me, even as Miamla smiled demurely and slipped down on the silk pillow at my feet. I shifted uncomfortably, but the dragonette ignored my dubious mood, as it was often her habit, and began to remove the bejeweled tortoise-shell combs and silk ribbons from her shiny hair, dropping them right on the carpet under her feet. Tonight Miamla was dressed in a silver-and-white concoction of lace and brocade, which made her resemble an exquisite porcelain doll; her exotic features looked lovely framed by the spill of her platinum-blond locks, her bright eyes shone mysteriously in the delicately blushing face. To my utter amusement, the little dragon always wore her dresses with the unobtrusive elegance of a veteran partygoer – taking things as they were, and never bothering to check on her appearance or adjust her garments. Combined with her innately graceful manner this attitude made her look extremely natural in every setting, dressed in any exotic or weird outfit. Omwo called it an in-born ‘sense of stage’ – a talent rather unusual in a child so small. I chuckled and moved my eyes from the little girl at the foot of my chair to the big one glaring at me haughtily over her brother’s head. Mirriam could have taken a lesson or two on style from the dragon child – the human’s pale green gown did not match her tanned complexion at all, and the way our assassin jerked her bodice and twisted her many-layered skirts told me that she was feeling very uncomfortable in all that northern finery. I silently smiled at the contrast between the two damsels, but kept my observations to myself. “Peace, children. I did not let Miamla out of my sight for the entire evening.” The halfling, who had divested himself of his wet cloak and boots, and was now warming his hands before the fireplace, sighed dolefully and rolled up his eyes, making an admonitory face at me behind Mirri’s back. The skin on his bald forehead moved in complicated patterns of creases and crinkles, as it was often the case when he was in a contemplative mood. I always thought that in such moments he resembled an elderly toad, lost in consternation over a half-digested fly. “The Sea Lion’s Pride is the most fashionable watering hole this side of the river,” Omwo continued after a brief pause. “And tonight the place was packed with more aristocracy than Castle Faemtam itself. In fact, the only ones who were missing were the Queen and her inner circle – but I suppose the Queen will invite him to the palace one of these days if the trend holds. The chap has the tongue of a honeyed viper, throat of pure silver, and the ear of a cat. There is a rumor that he is ‘supported’ by none other than Dame *** herself,” he chuckled after revealing the name of the notorious Darromarran noblewoman. “Is he really?” Kessen inquired with a yawn from his half-sprawled position on the sofa. “The fellow sure wore a fortune in rings alone,” he raised his own freshly manicured hand to admire the play of light inside the huge diamond in one of his new rings. “You make him sound like a professional gigolo,” Kessen snorted at Omwo’s comment. “Surely he is just a nice chap who knows his way around women. Maybe I should ask him for a tip or two,” he added defiantly. The dragonette beamed at her sleepily from her nest on the silk pillow. She was already half-asleep, and the rest of the argument was hushed by Mirri’s fussing over the child, and their departure. I had noticed before that Mirriam often employed Miamla’s presence to stop a conversation that was going in the wrong direction, and wondered if the dragonette understood that she was being used in this manner. Omwo was less than amused at my outburst, however he preferred to ignore it, although I wondered later if my rudeness did not result in his ultimate decision to take Eldoth up on his offer. Next morning I went into town on my regular trip, which included visits to both of the city’s markets and half a dozen magical shops. I purchased a few interesting items and talked the seller of a rare Amanuensis scroll into giving it up for a small fraction of its original price and my help with the translation of some obscure document he had been working on. (I simply noticed the manuscript on his desk and read him a few lines without giving it a second thought.) The look that he gave me afterwards was full of genuine awe, but I did not pay much heed to it until he mentioned that the language was Netherese, and explained that it had been dead for thousands of years. That gave me a nasty shock that I had to conceal from him, while pretending I had known the language was Netherese all along. Still, aside from that minor disturbance over the ever annoying tricks of my memory, the day was a success – or so I tried to pretend. And although I had not yet located a caravan or a military convoy departing north within a week or so, I had almost convinced myself that it was only a matter of time and that the looming deadline was not really important. So what if I was a week or two late – surely Evereska could not be destroyed in that interval! Besides, the water weird’s prophecy had been deliberately obscure: “no one shall open an ancient Vyshaan Tomb this coming winter.” What was that supposed to mean? That no old elven tombs should be unearthed by treasure hunters or archeologists anywhere on Toril? From a treatise on the ancient history of Faerun in the Castle Faemtam library I had learned that ‘Vyshaan’ was the name of the ruling dynasty in the ancient elven Empire called Aryvandaar. Aryvandaar had been destroyed in the series of devastating wars fought between several ancient elven kingdoms, and now long forgotten. That was all the information I could discover. Obviously, before I could make any sense of Aluril’s foretelling I had to reach Evereska and gain access to the genuine elven lore, not some brief snippets collected by amateur human historians. As I walked back into the Unicorn in a rather turbulent mood, I found both of my female companions in the lounge of our apartment, dressed once again in their casual clothing and so consumed with their current occupation that they did not even notice me at first. It was quite an amusing view. Two heads - one sable-black, the other silver-bright - were bent together over a sizeable sheet of parchment; two pairs of hands - one pale as snow, the other the color of a cinnamon stick - were laboring over a drawing that at a first glance resembled the spine of a dead dragon, but in reality was a detailed map of a section of the Marching Mountains. Which particular section became clear in a moment, after I noticed what it was that Miamla was doing. Her head tilted ninety degrees to one side, the tip of her tongue sticking between her lips in the show of exertion, the dragonette was daubing silver paint over the body of a winged creature drawn with some definite skill above one of the peaks. Slightly below it one could discern a dark circle of a cave and a small rectangle indicating a settlement. Mirriam was leaning over the table in the becoming austerity of her assassin leathers; and I noticed casually that she looked her best in her habitual pants and vest outfit - it hugged her slim figure like a second skin, accentuating her moderate curves. She was using a brass compass to measure the distances on the old atlas she had spread at her other side, and comparing them with the dimensions of her newly drawn ‘masterpiece’. Over the months we had traveled together I had learned that cartography was one of Mirri’s fancies, and had always thought it peculiar. But then, she had once told me herself that Esamon had taught her to read maps before she had learned how to read letters. The girl was a decent artist, (I now had no doubt about the identity of the vandal who had adulterated Chyil’s frescoes), and delighted in small crafts, (that fact I had known only too well since receiving the infamous snake head). Her worried face was telling me more than I wished to know. Still, I remained silent, but she continued, completely ignoring my displeased expression. I turned away from her deeply hurt stare and was ready to walk back into my room, past the table with her maps, when a delighted squeak and the feel of something small dropping down the hem of my robes drew my attention away from the ridiculous confrontation. I only had time to notice a flicker of motion on the floor, and a dark shadow climbing into Miamla’s lap. In a moment the four-legged thief was firmly enthroned in the dragonette’s hands, and she promptly deprived the creature of its burden, giggling and patting him on the head and muttering something in her slurred speech that was quite impossible to understand. “L...lle naa ruthaer ,” the little girl said matter-of-factly, firmly clutching my battered spellbook. But the child only looked at me with her bright mercurial eyes, and kept her silence. I noticed the name, and something of my embarrassment probably showed on my face, because her mirth intensified, and in the end she had to sit down on the bench by the table and let herself have it out, shaking in a fit of near hysterical merriment (that looked too much like a frenzied fit of despair for my comfort). When she finally calmed down to a semblance of normality, there was no amusement in her voice, and her eyes were too bright and not a little sad in her reddened face. The entire scene had winded up my nerves to a condition of near breaking, but her latest words had a stopping effect of a brick wall. I remembered the silly game back in the desert, and it suddenly dawned on me how incredibly ludicrous it all must have looked to an outside observer. My entire new life had been a rapid succession of serious mistakes, but to be accused of pettiness and irrationality, and to suddenly admit to myself that it was true, was pure unadulterated torture. I felt a sudden flush spread up my cheeks, and travel up, until the very tips of my ears were engulfed in a wave of most unpleasant heat. The emotion in itself was such a horrid mixture of sorrow, regret and panic, and it consumed me so entirely that I gaped like a fish pulled out of the water and dropped onto the hot sands of the beach. I believe it was the first (but unfortunately not the last) occasion when I felt shame – something I could not remember feeling before. I barely felt Miamla shove the spellbook into my hands, and saw Mirriam’s eyes full of exultant wonder. Then I fled the field, hiding the raging storm of conflicting emotions within my soul in the blessed solitude of my bedroom. high education or social standing.